The video for our the article Band Instruments is now available. You can watch it below or in the original article. There have been quite a few (13 to be exact) Instrument add-ons for Band in the last few days. Below is a list, screenshot, short description and video of each. I would highly recommend taking a look at the instruments and picking the ones that you like best. I found that Band can only handle around 3-4 additional instruments (besides the eight that come with it). Even then it randomly crashes. When I installed more than 4 additional instruments, Band would open to the splash screen hang there a minute and then close back to the SpringBoard. 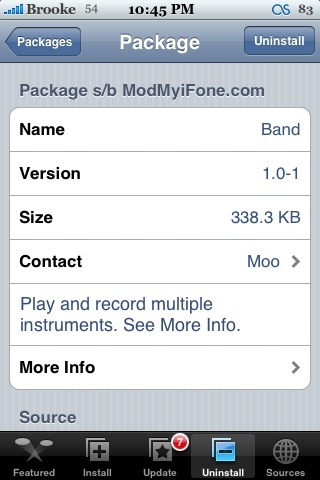 Band is available through the ModMyiFone source. 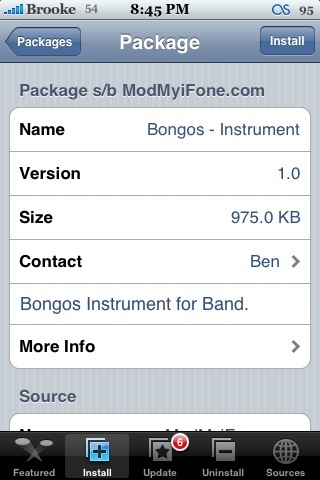 All of the following Instruments are also available through the ModMyiFone source.